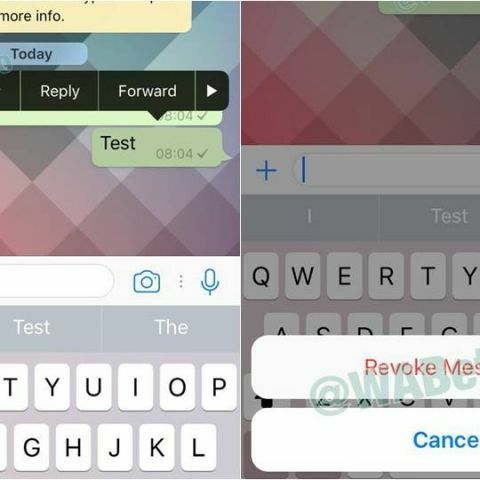 WhatsApp has been testing the recall and revoke feature for the past few months. The feature has been spotted on beta builds for iOS and Android. WhatsApp seems to be getting closer to rolling out the much-rumoured recall feature on its social messaging platform. The feature has now been spotted on Windows Phone beta indicating the imminent launch. The feature was first seen being tested in beta builds of iOS and was also spotted being tested on Android. WhatsApp's recall feature has reportedly been spotted on beta version 2.17.218 of the Windows Phone app. According to WABetaInfo, the feature allows users to revoke their messages before it's delivered to the recipient. The feature seems to work similar to Gmail's "Undo Send" feature, allowing users to recall their message within a fraction of seconds. The report notes that WhatsApp has also added a "Learn More" button in its recall confirmation windows aimed to help users understand the feature. The feature is disabled by default indicating WhatsApp is still working on it and will enable with a future update. The recall and revoke message feature was said to arrive first on iOS with a future update before being rolled out to Android and Windows. Based on previous reports, WhatsApp's recall feature is expected to work only by tapping on the message. The users will have only a few seconds to take action and the message gets deleted immediately after the recall button is pressed. There are also rumours of WhatsApp adding an option to delete messages even if the recipient has read them. The WhatsApp beta version 2.17.218 for Windows Phone also adds an option to select multiple chats and mute or enable notifications and pin/unpin the selected chat. The feature is aimed to streamline the chat experience on Windows platform. Will windows release windows 9 on phones as well?